A Newly Renovated Home Gets Equal Attention To The Outdoor Living Space. 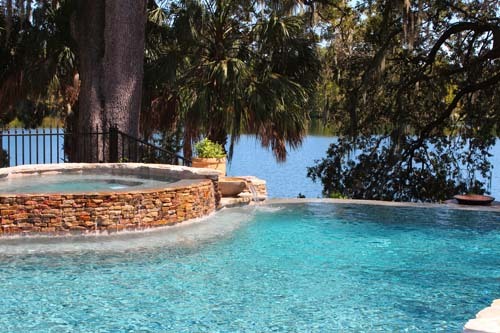 It is often said that renovating a pool requires more skill and talent than building one from scratch. I tend to agree. Coordination of old and new must be handled correctly or your outcome will be less than desirable. When your project requires transitioning from, replacing or adding to, choosing the right builder is even more important. Deciding what has to go and what stays, what blends and what doesn't, addressing changing elevations, existing drainage, equipment replacement and it goes on and on. I don't want to discourage anyone but one should know that before you operate, you want to choose the right talent for the job. 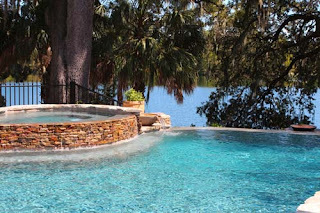 Sea Maiden Pools was referred by a Winter Park Custom Builder, Skolfield Homes who had recently completed the renovation of this beautiful home. The client invited Wayne and I to their home and we began to assess the scope of the project. The home's lanai and summer kitchen area was beautifully designed which made our job that much easier. The focus was to blend their "existing" with our "new" design for the pool and make it look like it was there from the beginning. As you view the video you can see details of the transition from existing lanai to the new paver deck. Pool coping that was made for remodeled pools keeps with their contemporary look and feel. Clean lines, coordinating waterline tile and the perfect interior finish to give that pool the nighttime glow just fitting for this magical experience. 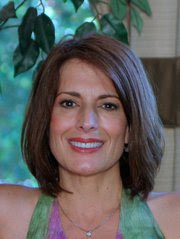 ﻿﻿﻿﻿﻿﻿﻿﻿﻿In getting to know our clients better, they said they recently moved to Orlando to be closer to their grandchildren. Creating a space that was exciting and fun for them was very important. It was all about the quality time they would spend with their family. This remodeled pool captured their attention with the starry lit grotto water fall and its fiber optic colored lighting. A truly Magical Experience! ﻿ I hired a photographer to take pictures of our latest projects and on my way to our first appointment I was focusing on these clients and thinking how much our industry has changed. The market is so much more involved in the design and build process of any construction project and they expect a level of sophistication to meet their needs. Most people had a perception of pool builders as the "brick and mortar" component to their outdoor living space. That may be true when you only consider them as the laborers for constructing the pool. However, to meet the expectations of today's client, a custom pool builder must broaden their scope of business to include the skill of a good space designer and interior designer. My clients have come to expect the same level of attention to detail as if they were building new or remodeling their interior space, hiring an architect or residential designer for the design/space plans, a custom builder for the construction and an interior designer to choose all the colors, materials, fixtures etc.. all to bring about a consistent look and feel to their liking. The outdoor living space is just an extension of their interior living space and should be held to the same standards. 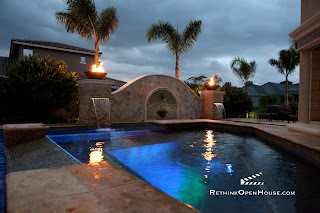 I describe Sea Maiden Pools as a "design and build company for outdoor living spaces" but it seems I need a more descriptive tag line to encompass all these other aspects we do. Any thoughts? This site allows businesses like mine to tap into the latest technology, navigate through the complexity of social media & SEO, and build an effective ”elevator” sales pitch that will maximize a company’s presence on the web.